I'm not regaining your trust am I? See, I know I was absent last Friday but I really did have something come up that prevented me from posting: my pride. I had a great one written congratulating the Milwaukee Brewers on their unexpectedly great playing in the NLCS but suddenly got cold feet as it looked like the Los Angeles Dodgers had it locked down when they went 3-2 after their Game 5 win. I know the Brewers had a chance to come back and win the series but I just wasn't feeling it by the time it was time to publish so instead of starting over with a sad post, I caved. At any rate, it looks like the Red Sox are about to make quick work of the Dodgers in the World Series so my spirits are up again! To celebrate that, this week's cap involves the Brewers as well as the two teams that they faced in the postseason: the Colorado Rockies and the Dodgers. From 2015 through 2018, the Colorado Springs Sky Sox were affiliated with the Brewers but from 1993 through 2014 they were the Rockies' top farm team and in 2019, the team is moving to San Antonio to be the latest incarnation of the San Antonio Missions. The Sky Sox rocked this logo from 2009 through their final season in 2018. I dig the drop shadow lettering but I do think it would have been a good idea for them to freshen up the look sometime over the last few years. No way to know by looking at sweatband tags what year this cap is from but it's Made in U.S.A. so it has to have some age on it. Red, white and blue MILB batterman to match to front logos colors is looking good here. The Missions haven't been associated with the Dodgers since 2000 but from 1977 until then, they were the Dodgers' Double-A affiliate and that's how I'll always remember them which is weird but I guess my mind is stuck in the past. I think the Sky Sox entire identity is also trapped in time since the team's name originates from the years they were an affiliate of the Chicago White Sox which was 1950-1958. 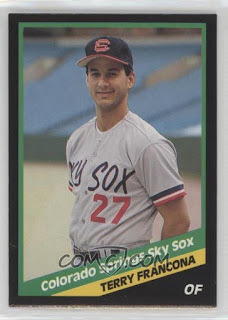 Tito's looking baby-faced in this card from 1988. I might need to get my hands on this version of the Colorado Springs Sky Sox cap one day. Thanks for checking out this week's post and hopefully the fact that I wrote about a team with the word "Sox" in its name means that the stupid Red Sox will triumph over the dumb Dodgers. This cap is not going on the Trading Block but please don't hesitate to reach out if you want any cap from that list and you are willing to part with any of the hats on my Wish List.